Provide comfort for the family of John Mikan with a meaningful gesture of sympathy. 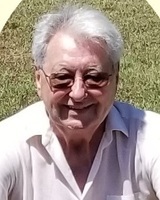 John Mikan, age 81 of Mineola, passed away on Friday, March 22nd, 2019 in Tyler. He was born on June 9th, 1937 in Monessen, Pennsylvania to the late John Mikan and Diana Yagodich Mikan. John was inducted into the US Army in 1961 and honorably discharged in 1963. In 1985, he married his wife, Iveleta Smith in Las Vegas, NV. They resided in Van Nuys, CA prior to moving to Mineola. He worked for the United States Postal Service as a letter carrier for 30 years, he was also a member of the National Association of Letter Carriers. He was preceded in death by his parents, John and Diana Mikan and his wife, Iveleta Mikan. He is survived by his brother, Vince Mikan; step-daughters, Brenda Bateman, Carol Darling, Sandra Burleson, Debra Owen and Karen Tuttle; and numerous grandchildren and great-grandchildren. Mr. Mikan’s family will hold a private Celebration of Life Service at a later date. To send flowers in memory of John Richard Mikan, please visit our Heartfelt Sympathies Store.